Description: Scanned from a 35MM. date approximate. Description: The EVEROO Garbage Train leaving Delta Yard on the SeaLine. 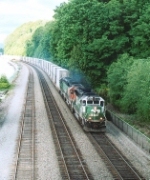 Description: EVEROO garbage train picks up steam past Howarth Park in Everett. Description: Empty garbage train ROOEVE glides through Bayside Yard heading for Delta Yard. Those big piles of white stuff between the rails is alumina from a badly leaking covered hopper. Description: Garbage train rolls through Bayside Yard in Everett. Description: Leading a southbound train through Minto. This was taken before PNWR began running this train. Description: Discussing the upcoming switching moves. Description: BNSF south bound train No. 663 passing Oregon City Amtrak stop. It's heading to Salem. Description: Now this is a lashup!!!!!! Description: Interbay Yard, base of Magnolia neighborhood. Don't often see the big BN Logo anymore! Description: BNSF calls them GP25s now as they have been derated to 2500HP. Description: BNSF's Annie local with an ABBA lash-up crosses the Swinomish Channel swing bridge. Description: BNSF's Annie local sports a colorful ABBA combination. Description: An "ABBA" power consist on BNSF train 815, the Annie local. Description: BNSF 3143 at Delta Yard in Everett, WA. Description: BNSF's Annie local builds her train at Burlington. Description: A bonus in the form of two GP50s in the yard at Burlington. Annie on the left, Burley on the right. Description: BNSF's Annie local heads west (railroad south) on the Anacortes spur.